The contestants have now gone through 7 consecutive rounds of increasingly difficult identification trials, but all have emerged with perfect scores so far. We join the event in progress, where our candid microphones are able to pick up private conversations within each duo that the other contestants can’t hear. Frasier: Niles, do you see what Obi-Wan is doing over there? Why does he keep waving his hand in that strange manner towards Homer? Niles: I think we should just mind our own business and concentrate on eliminating these dimwits. Frasier continues to study Obi-Wan. Meanwhile, it is Homer’s turn to taste. Mr. Burns: Excellent, Simpson. I would never have believed a person of your mental capabilities would have attained a perfect score so far. Let the savant inside of you continue! Homer examines the glass of wine before him. He picks it up, swirls and does a sniffy sniff. All of a sudden a dreamy look comes over him. Mr. Burns: Donuts??!? Simpson, compose yourself, man! 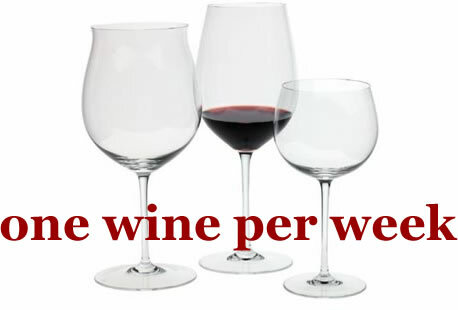 What is the wine? 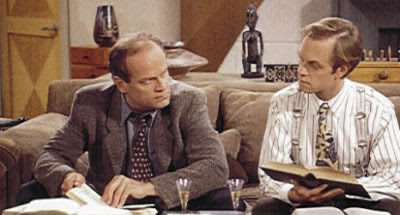 Frasier: Niles, I know what he is doing! Niles: Frasier! Just mind your own business! Let the lout eliminate himself! Homer: (dreamily) My guess is Chateau Donut. That's my final answer. Judge: A guess that is wrong has been made. Eliminated you are. Frasier: Mr. Burns, my sincere condolences. I must tell you, though, that you are a victim of treachery! Did you notice how Obi-Wan kept waving his hand at Homer? He was using an old Jedi mind trick on him! Mr. Burns: Jedi mind trick, hmmm? Well it must not have been too difficult when played upon such an imbecile as Simpson. I will have to deal with this right now. Mr. Burns strides over to Luke and Obi-Wan. Mr. Burns: Hello, Luke and Obi-Wan. You have one less competitor to worry about now. Luke: I’m sorry Mr. Burns. May the Force be with you, however. Mr. Burns: Oh, really? Luke, I have something to tell you. Luke, I… am your father! Luke: (after digesting this statement) Noooooooo! Obi-Wan: Luke! Calm down! It’s not true, Luke! Mr. Burns: Feel the Force, Luke. Inside of you, you know that it is true. Come over to my side and replace that blithering idiot Simpson and together we can win the entire contest! Luke is too psyched out to listen and he goes running outside of the building, thereby disqualifying himself and his partner, Obi-Wan. Obi-Wan, meanwhile, holds his chest and staggers because of the sudden disturbance in the Force. Mr. Burns: Thank you, Mr. Crane. Frasier: Don’t mention it. Even though we are competitors, in the spirit of fair play and good sportsmanship, I felt that I had to inform you of what was taking place. And that leaves only two teams to go head to head with one another: Frazier and Niles Crane, and The Skipper and Gilligan. Stay tuned to see who emerges as victorious in this competition!